Myosotis Boraginaceae, the forget-me-not flower, is a much loved small flower, growing in clusters and ranging in colour from white and pink through to the more commonly seen blue. It has five petals with a yellow centre. 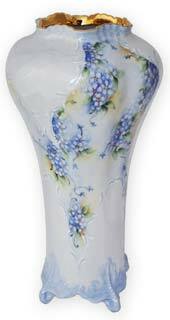 For centuries forget-me-nots have been a favourite subject of porcelain painters and are often used to compliment small, ornate shapes. Unlike many flower designs that require careful placement, forget-me-nots are positioned loosely to best compliment the porcelain shape. Once you begin to block in colour to a selected area, the design seems to grow and develop itself giving a wonderfully free way to paint! 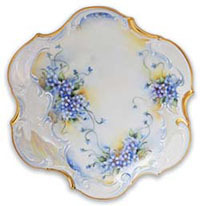 The three-fire example shown incorporates a mother-of-pearl cartouche bordered with blue painted scrolls. 1. Begin by blocking in colour with cross-hatch strokes into which you will wipe out flowers. Colours used: white, three values of blue (light, medium and dark), add a touch of deep rose to darkest section to add warmth. Leave paint to dry slightly before wiping out the flowers. Using a fine wipe out tool outline flowers (see diagram) then using a small pointer brush blend petal towards flower centre. Remove any paint build up from flower centre and paint with warm yellow. Paint in leaves tucking under flower clusters using yellow-green. Fire 810°C. 2. Apply wash of blue and/or white over flowers. Add a little yellow around edge of design. Under topmost flowers and using ‘C’ strokes apply darker value blues under petals in shadow areas. Deepen yellow in flower centres. Add shadow to leaves using french black green. Redefine edges of flowers using wipe-out tool. Paint in trailing tendrils and flower buds. Fire 810°C. For ornamental pieces, raised paste or enamel tinted a very light blue can be added to the petal edges of prominent flowers to accentuate them. Liquid bright gold and lustre embellishments also compliments the subject very well. In medieval Europe the forget-me-not flower was a symbol of faithfulness and affection. Folklore has it that a knight was walking along side a river with his betrothed when he bent over to pick her a posy of flowers, however the weight of his armour toppled him into the river. As he was drowning he threw the flowers he had collected to his beloved and shouted ‘forget-me-not! They symbolise love and affection to this day. Illustrated above is a very delicate hand embroidered postcard featuring forget-me-nots sent to my grandmother and young bride, by my grandfather from the trenches of France during World War 1.
illustrated various forget-me-not pieces painted by Anne Blake. Photographs © A Blake 2017.